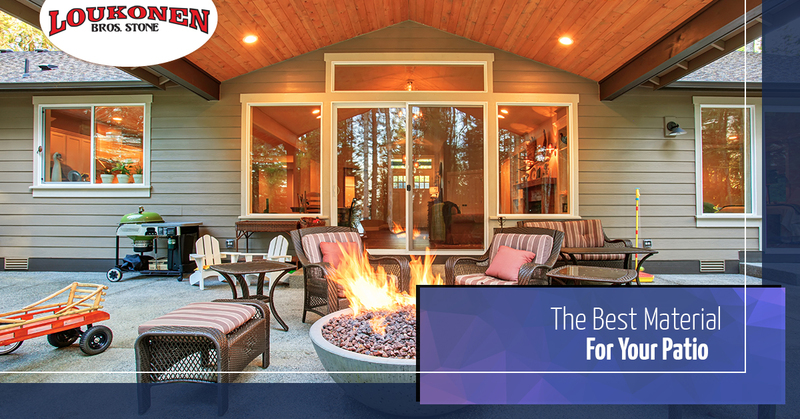 Patios are often one of the biggest and most prized investments a homeowner can make aside from the home itself. Your patio is the centerpiece of your outdoor living area, so it’s only natural to put a lot of time into making it just right. And this isn’t always easy, especially considering the amount of options you have as far as materials and designs go. Budget is another deciding factor. If you set your budget too low, you might end up with a patio that doesn’t meet your standards but it’s too late to go back on. In this blog, we’re going to talk all about patio materials, what options are available to you, as well as the costs associated with each. First of all, it should be noted that you should take time to figure out what material will be best for your home. Although right now you may be thinking that you should go with concrete since it’s one of the cheapest options, you should take other things into consideration like how long you’ll be in the home and what you want to do with your patio after the foundation has been laid. If you spend a lot of time on your patio, you’re going to want to invest a bit more in it so that you enjoy the time you spend there. Keep reading to learn more. Flagstone, or natural stone, includes travertine, limestone, sandstone, bluestone and slate. Each type of natural stone has very different qualities, color, and texture. And they can be found all across the US. One of the major benefits of flagstone is that they allow water through them into the ground below, rather than having to run off. Flagstone has a natural look, it’s slip-resistant, and is some of the most durable patio material on the market. The natural appearance and feel of flagstone is due to the way it’s formed. It’s created through the gradual accumulation and solidification of clay, sand, and other minerals or organic sediments. Over time, it forms into a stone that is perfect for use on your patio while still being good to look at. One of the most common flagstone designs in modern homes is to have random rectangular patterns that look much more formal than other patterns. If you mortar this pattern, it will be ideal for outdoor living, allowing you a smooth surface to walk on and move things like chairs across the surface without damaging the stone. If you want a more organic look for your flagstone patio, you can use irregular patterns. This shows off the natural shape of the stone while groundcover, small stones, or mortar are used to fill the gaps. Although this creates a fairly smooth surface, it’s not the best option if you will be spending a lot of time on your patio. Because of the irregular gaps between the stones, it will be more difficult to move things around like furniture. Concrete is one of the most basic and plain patio materials you can use. However, in order to make it look a little more appealing, use a stamped pattern that can be dyed for a more authentic look. Another thing you’ll need to be aware of is the maintenance issues that come along with using this material for your patio. In order for it to maintain its color, you’ll need to reapply the coating every two years. Unlike flagstone, concrete may become damaged very quickly due to a sudden change in weather and simply from regular wear-and-tear. The main benefit that it’s the cheapest way to have a hard surface in your yard. Loukonen Bros Stone is your Top Rated Local® stone supplier in Longmont, Lyons, Boulder, Denver, and the entire front range. However, we also ship nationwide! We are one of the oldest sandstone quarries in the United States and are committed to providing you or your company with the highest quality stone in the area. We offer sandstone, flagstone, natural stone, decorative stones, patio slabs, patio pavers and much more. If you have any questions, give us a call today.